criteria for selecting the best massage table. pick from our editorial team. Personal massages are a wonderful way to relax, and release unhealthy toxins. Massage therapy has been known to relive stress, headaches, insomnia, and speed healing from sports injuries. For those giving massages, a table is one of your most important investments. It provides comfort for the recipient of the massage and will assist you in providing much needed services. Tables can be carried to events to promote your business or used in client’s homes. Professional portable massage tables must be sturdy enough to not only hold the weight of the individual but also the pressure on the table produced during a massage. They must be comfortable to lay on and provide support for your client, yet offer enough give when pressure is applied to loosen muscles in the body. Most tables also provide addition benefits like height adjustments that allow the table to be moved up or down based on the type of massage given and the height of the massage therapist. Face cradles are generally included which provide a comfortable place for the recipient to lay their head. Tables are used by more than just massage therapists. They are valuable for home use and can be used for everything from increasing the circulation for elderly family members who are less mobile, to estheticians who want to give facials. Medical doctors and nurses who make house calls can also use massage tables due to their portability. These tables will benefit both students and professionals alike. Others obtain massage tables for home use because they are both practical and affordable. The tables fold up compactly and are easy to store. Massage tables come with a range of features that are essential for both the recipient and the therapist. 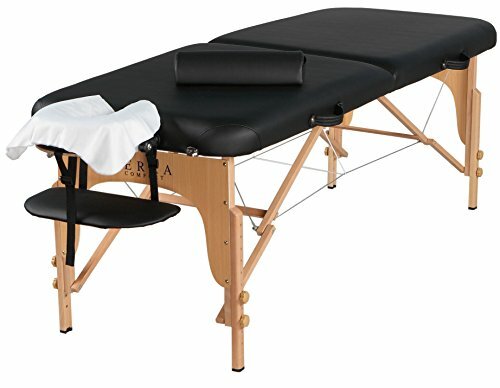 The Sierra Comfort Aluminum Portable Massage Table is a top pick because it is a lightweight, compact table that is easy to pack up and carry with you. This table is a standard 74 by 28 inches in size and can fit clients of all heights and sizes. The aluminum frame is lightweight and only weighs 29 pounds. The table is sturdy enough to hold up to 300 pounds. The Sierra Comfort Aluminum Portable Massage Table features adjustable heights, allowing you to set the table at the correct height for you and the type of work you are doing for the client. The top of the table is covered with high density foam that is 2 ½ inches thick of foam decking. The decking cover is both water and oil resistant and easy to clean. One unique feature of this massage table is that the back of the table adjusts up, allowing you to offer additional services like facials. Doctors who conduct house calls can benefit from these tables because of this feature, in addition to massage therapists, massage students, and home use. A carrying case with a shoulder strap is also included, making the table easy to carry. The table folds up into a compact size for additional storage and portability. Also included is a removable and adjustable face cradle, a head cradle, a forward swing arm and an arm cradle. 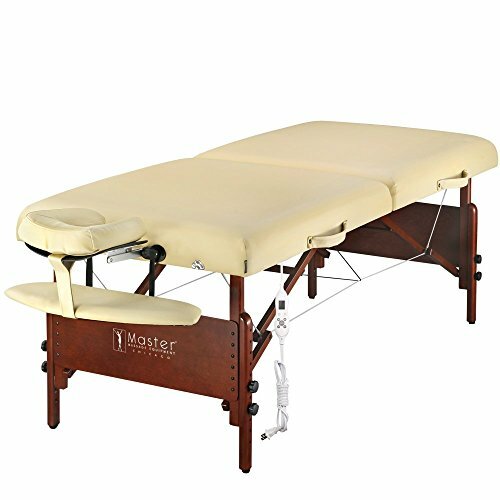 The Master Massage 30 Inch Del Ray Pro Portable Massage Table is a top pick because it offers a top quality luxurious table with a heated bed. This table is a standard 72 X 30 inches and only weighs 33 pounds. The table folds compactly to approximately 3 feet by 3 feet and 10 inches wide. With these dimensions the table is able to be packed away under a bed or in a closet with ease. It is also easy to transport to multiple locations. The Master Massage 30 Inch Del Ray Pro Portable Massage Table offers an adjustable height ranging from 24 to 34 inches, depending on your needs. The Quik Set knobs takes 70% less effort to adjust the height than standard tables. It also features an auto locking system on the legs which makes it extremely study. The table can hold a pressure of 1500 pounds and a maximum weight of 650 pounds. The support cables are made from aircraft grade steel for the strongest possible support. The body of the table is crafted out of walnut for the legs and Beech wood for the body. It includes a high gloss protectant seal for a long lasting finish. The upholstery includes a cushion that is three inches thick and made with three different materials including small cell foam. This offers a luxurious feel when lying on the table. The fabric is a luxurious leather material that is abrasion, oil and water resistant. The sand color is both attractive and easy to clean. Included with the table is an ergonomic adjustable face cradle and a face cushion. A padded arm shelf, two pockets and a carrying case with carrying strap. A 5 year warranty comes with the table. The Best Massage Portable Massage Table is the top pick because it is comfortable, compact, and lightweight. The table can hold up to 450 pounds and is made of top quality wood. This table is perfect for home use, students, and professionals. The table is a standard size and is 73 inches long and 28 inches wide. The table adjusts in height from 24 inches to 33 inches based on the type of massage you are doing and your personal preference. The Best Massage Portable Massage Table is made from top quality timber and crafted with precision. A premium carrying case is included, which makes transporting the table easy and compact. The table weighs 37.5 pounds. The top of the table is covered in black material and the foam density is 2.5 inches. The table breaks down into two sections and can fold compactly when storing or carrying. This table allows you to bring the table to the client easily. Also included are luxury padding, an arm rest, and a removable face cradle. A cradle pad, side arm extenders and a carrying bag are also part of the package. All of our top picks are built from top quality materials and come in the standard length and width. They also all offer adjustable heights ranging from 24 to 34 inches depending on your needs. The Sierra is the lightest weight table and is made from aluminum and comes in at 29 pounds. The Best Massage and Master Massage tables are 37.5 and 33 pounds respectively, with the Best massage table weighing the most. Both of these two tables are constructed out of wood which weighs more than the aluminum frames. The advantage of wood frames is that is able to hold more. The Master Massage holds the highest weight at 650 pounds, where the best massage can carry 450 pounds and the Sierra holds the lowest weight at 300 pounds. Both the Best Massage and Sierra feature a 2.5 inch foam padding, where the Master massage comes in with a 3 inch luxurious padding. Both the Sierra and Master massage use material that is both oil and water resistant, which is important when dealing with massage oils and lotions and make for easier cleaning, lengthening the time the material will last. What is a Massage Table? 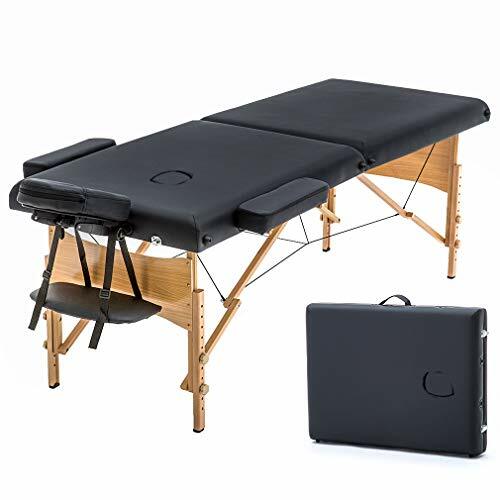 If you are looking for a convenient and easy way to provide massage services a portable massage table is both compact and sturdy enough for you to carry with you. Choosing which massage table will meet your needs will be determined by a number of factors. What type of work will be done on the table? When using a massage table for massage work you must consider what types of massage you practice to ensure the table will be strong enough to handle the work. For those who use massage tables for other uses, there may be features you will look for such as head rests, rising back, height adjustments and other considerations that make the table a great resource beyond just massages. Deep tissue massage, trigger point massage, or sports massage require a very sturdy table, meaning lighter weight aluminum tables will not generally offer enough support. You will need to choose a heavier table that can handle more pressure for the work you do. Energy practices such as reflexology, therapeutic touch, reiki, or cranio sacral therapies should not work on tables designed from metal and do not require heavy padding. Massage therapies like shiatsu, Thai, and other Eastern therapies massage complete a lot of work on the floor. Working with tables that are more versatile and lightweight will be the most useful options. For example, a table with legs that fold inward will allow you to place the table bed directly on the floor. Spa treatments like facials and prenatal work are often preformed with the client sitting up. Tables that are able to raise the back end of the table to a sitting position are best for these uses. Medical personnel often use massage tables for house calls and this would also be a valuable feature for those uses. Where will you practice? Not all tables are portable and not all portable tables are easy to move. If there is any chance you will need to move the table, choosing a portable table that folds down compactly will make the transition from locations fast and easy. How much weight can you comfortably carry? Massage tables range in size and weight. Heavier tables can be upwards of 50 pounds and are much more difficult to carry than those that are nearer to 30 pounds. What accessories will you need? Massage tables generally come with a face cradle. But many therapists look for other features such as arm rests and carry bags which make the table easy to pack up and move from place to place. What material is the massage table made of? Massage tables can be made from metal or wood. Metal tables like aluminum are more lightweight and easier to carry but do not hold as much weight and pressure as their wooden counterparts. Wooden tables are very sturdy but have a higher overall weight. Metal tables made from aluminum can hold around 300 to 400 pounds where wooden tables may be able to hold as much as 600 to 700 pounds. What kind of padding do you need? Padding needs are based on what type of work will be completed on the table. Some types of massage do not need much padding, while others do. Some tables only have an inch or two of padding. 2.5 inches is the most commonly found among good quality tables. High levels of padding increase the comfort of the recipient and can be important with higher level massages like deep tissue or sports massage therapy. What material is used to cover the padding? Material that is oil proof and water proof will last a lot longer than those that do not because you work with oil or lotion during the treatment. Some material is also snag proof making is very durable. Most padding features a leather or leather like material that does not absorb moisture easily. Do you need an adjustable head cradle? While face cradles are optional, most therapists use them and clients appreciate a comfortable place to lay their face during a massage. The face cradle also keeps the neck safe during treatment. Most tables come with a padded face cradle but not all are adjustable allowing you to move it based on the client’s comfort. Table height and height adjustments are one of the most sought after features. Adjustable tables will adjust to different heights and those ranging from 24 to 34 inches offer the highest levels of adjustments to accommodate different therapies and the height of the therapist. Not all height adjustments are alike. The easy to moving the table to different heights will impact the set up time. What are the dimensions of the table? Not all massage tables are the same size. Lengths range from 70 to 75 inches with 73 and 74 being the most common. Longer tables can accommodate taller clients. Widths range from 23 inches to 30 inches, with 28 being the most common. Narrower tables can be less comfortable for clients and may be harder to work with. A few inches’ really matters when it comes to a massage table. Accessories included. This might include everything from arm rests or supports, arm extensions, carrying bag, carrying strap, and pockets to place lotion and oils. Massage tables are an essential part of the job for massage therapists. Adding a portable table will allow you to take your practice with you wherever the client needs. This might include home visits or taking the table to shows or events where you are able to promote your practice. However, you decide to use your table, choosing one that will best meet your needs and selecting a table that is both durable and compact can provide you with many years of use and a fast return on your investment.